It should come as no surprise that President Obama will raise taxes if he is re-elected. But here’s the shocker: He will invite the United Nations to tax Americans directly. And the proceeds would go directly to the Third World. In this way, Barack Obama will, indeed, realize the dreams of his father. In our new book, “Here Come the Black Helicopters: UN Global Governance and the Loss of Freedom,” Eileen and I describe how there is now pending in the U.N. all kinds of plans to tax Americans and redistribute their wealth – not to other Americans – but to other countries. These taxes will not be like our U.N. dues paid by a vote of our Congress. Nor akin to foreign aid which we choose to give. They would be mandatory levies imposed by treaty on American citizens. And, since they would be enumerated in a Treaty – not an act of Congress — only the president and the Democratic Senate need be on board. The Republican House has no role in the Treaty-making process. A “Robin Hood” tax on financial transactions. Every time you buy or sell a stock or a bond or exchange money while travelling, you’d be hit with a financial transactions tax (a percentage of your transaction) that would go to the UN. A global tobacco tax with the funds to flow to the World Health Organization (WHO). A UN-imposed tax on billionaires all over the world. And don’t delude yourself for a moment that it is only the 1600 current billionaires who will be hit. Once the precedent of a UN tax on US citizens is approved, it will gradually grow downwards to cover more and more Americans. Again the funds will go to the UN. Under the Law of the Sea Treaty – up for Senate ratification in December of the lame duck session – offshore oil and gas wells would have to pay a proportion of their revenues to the International Seabed Authority, a UN-sponsored organization, which would distribute the loot to the third world. A carbon tax on all U.S. or other foreign commercial or passenger aircraft flying to Europe. Nominally to fight climate change, these revenues would also go to the third world. A mandatory assessment to be imposed on the U.S. to compensate third world nations for the costs of reducing their carbon output. On June 14, Sen. John Kerry, chairman of the Senate Foreign Relations Committee, held hearings to support the Obama administration’s goal to make the United States a signatory to what is clearly a controversial and flawed United Nations Convention on the Law of the Sea (UNCLOS). The fact that we as the premier maritime power in the world would submit our freedom of navigation rights as well as issues dealing with our sovereignty to a U.N. bureaucratic International Seabed Authority based in Jamaica should raise serious concern. The argument made that we must have a “seat at the table” to secure the U.S. Navy’s freedom of navigation and other transit rights, including the right of innocent passage, is nonsense. What’s green and blue and grabby all over? President Obama’s new pressure campaign for Congress to ratify the Law of the Sea Treaty (LOST). Back in 1982, President Ronald Reagan decided not to sign a treaty known as “Law of the Sea” (LOST), a United Nations convention that would raid America’s treasury for billions of dollars, then redistribute that wealth to the rest of the world by an international bureaucracy headquartered in Kingston, Jamaica. But today, the Obama Administration has revived that treaty, and tomorrow Senator John Kerry (D-MA) will hold hearings designed to illustrate its supposed benefits and generate support for its ratification. Without a doubt, Reagan’s decision should stand, and LOST should remain relegated to the trash bin of history. The rationale for LOST is that it supposedly brings order to the world’s oceans, defines the rights and responsibilities of nations as they navigate and conduct business across the seas, protects the marine environment, and allows for the development of natural resources of the deep seabed. On the surface, these all sound like worthwhile goals. The thing is, the United States doesn’t need to join another United Nations treaty to make it happen. For more than 200 years before LOST was adopted in 1982 and for 30 years since then, the U.S. Navy has successfully protected America’s maritime interests regardless of the fact that the United States has not signed on to the treaty. The United States’ navigational rights and freedoms have been secure, and they are best guaranteed by a strong Navy. Sea-Treaty Vote Put Off Till After U.S.
EXCERPT FROM THIS ARTICLE: Opponents, including the Heritage Foundation, a conservative think tank, have suggested that joining the treaty would cede too much control of the seas to the United Nations and other international bodies. …..Other Republicans said they suspected the treaty would impinge on American sovereignty, for instance, by forcing the U.S. to agree to international emissions controls to comply with treaty provisions on pollution over the oceans. WASHINGTON—A key Senate Democratic leader said he won’t push for a vote on the politically divisive Law of the Sea treaty before the presidential election in November, but will seek to line up support for ratification in the coming months. Sen. John Kerry (D., Mass. ), chairman of the Senate Foreign Relations Committee, opened a series of hearings on Wednesday, inviting Secretary of State Hillary Clinton and Defense Secretary Leon Panetta to argue for ratification of the long-stalled pact. 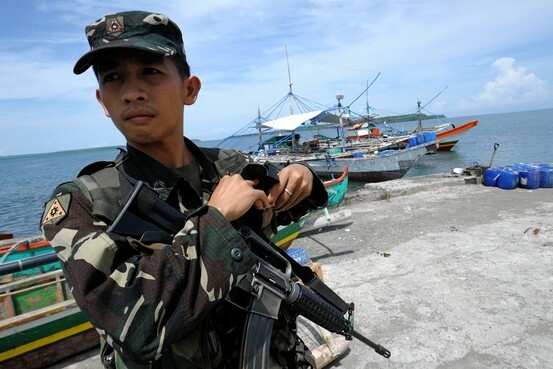 Agence France-Presse / Getty Images A Philippine soldier in Masinloc, 140 miles from the disputed Scarborough Shoal area in the South China Sea. Mr. Kerry said he hoped to avoid ensnaring the treaty, which is opposed by some conservatives, in the presidential election campaign. Obama administration officials want ratification this year, but said a vote could be held in the lame-duck period following the election.